This lovely necklace embodies the sentiment that thought love is not always seen, it is always present. 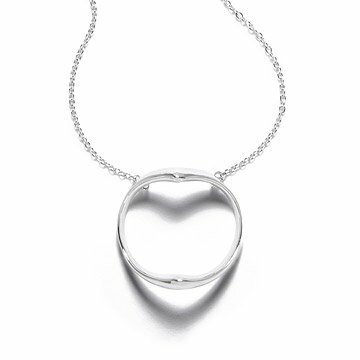 Hiro Yuki's pensive necklace embodies the sentiment that though love is not always seen, it is always present. The silver pendant's unusual shape is designed to catch the light in such way that it casts the shadow of a heart on the wearer's skin. Beautiful for its subtlety and meaning, this understated piece speaks to the heart and represents the love of others we carry with us always. Made in China. Clean it with a soft polishing rag or fine cleaner, but never usechemical based silver cleaners because this will damage the rhodium finish. I gave it to my wife on our wedding day. The sentiment behind the meaning of the necklace "love is invisible but always present" was perfect for the occasion. She loves it and shows everyone that it cast a shadow of a heart in the light. I received this gift from my high school girlfriends when my mom passed away a month ago. This is really lovely. It is unique and truly does cast a heart shadow. The chain seemed a bit light at first, but after wearing it for a few weeks I think it is fine. The center is a nice weight and I love the size. It is cleverly and beautifully designed with clean, modern lines. I have received many compliments and inquiries about this piece. The packaging was quite pretty also, a small silver canister with carefully cut out dark foam to cradle the heart and a separate little cutout for the chain. Just the little extras to add to the experience. The necklace was just right for the occasion and the packaging was very nice because you can store in the necklace in the tin that came with it. Bought it for a gift, but liked it so much I kept it for myself. I wear it in memory of a grandson that died 2 hours after birth. She has not taken off the necklace since I gave it to her. I would buy this product, as well as many others. I love this necklace. It is comfortable and unique, I seldom wear any necklaces because they always shift. Not this one.